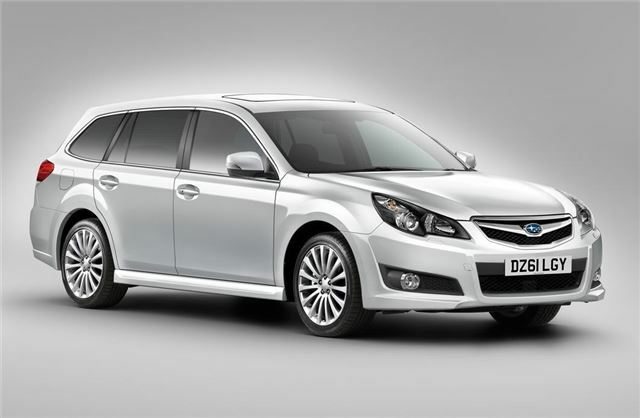 Subaru has improved the Legacy Tourer which now comes with the next-generation 2.0-litre Boxer diesel engine offering better fuel economy and lower CO2 emissions. Subaru is also promising improved refinement and comfort but what makes the biggest difference is the introduction of the new 'Everything Taken Care Of' package. Prices start at £26,865. The improved Boxer engine now has a more efficient turbocharger along with several other improvements which boost fuel economy to 49.6mpg (previously 46.3mpg) while CO2 levels are cut to 149g/km putting it in VED Band F, currently £130 a year. There's no drop in power though with the 2.0 D engine producing 147PS and 350Nm of torque. Other changes include a smoother shift on the six-speed manual gearbox along with suspension modifications designed to improve ride comfort. On the outside the changes are minimal with smoother door mirrors and a new colour - Ice Silver Metallic. Inside the improved models get a single CD stereo with an LCD display along with USB and iPod connections plus a muti-function steering wheel. Standard equipment includes dual-zone air conditioning, cruise control, Bluetooth, a sunroof, automatic lights and wipers plus an electric driver’s seat. All but the S model have a black leather interior. SE and SE NavPlus models now feature a ‘Sports Package’ which gets a sports front bumper and front grille, dark tinted headlamps, larger 18-inch alloy wheels and special Bilstein dampers. SE NavPlus models also feature a new DVD navigation system with a high-resolution eight-inch display. Like all new Subaru models, the Legacy Tourer comes with the new 'Everything Taken Care Of' programme. This includes 11 different elements designed to make owning a Subaru cheaper. Minor dent and scratch repairs, alloy wheel repairs, monthly wash and vacuum, an annual full valet, lost keys replacement, service collection and delivery, annual wheel alignment check, first MoT cover (and contribution to repairs), accident management service, insurance excess cover contribution, plus winter wheel and tyre storage are all included. All in all Subaru reckons it's worth around £7000.